Curtains hung in Mique’s kitchen made the space dark and didn’t fit with her white kitchen remodel. Replacing the former homeowner’s blinds with Premium Wood Shutters brightened the space and added the cherry on top to this makeover. Mique’s blog started as a way to keep family up to date, but fun crafts, to-do lists and tutorials took over to form an even better creative lifestyle blog. Readers love her printables, out-of-the-box gift ideas and delicious recipes. 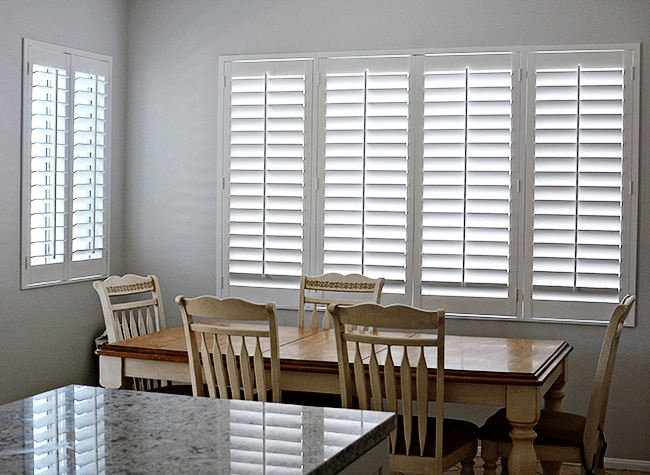 Premium Wood Shutters replaced broken blinds and dark curtains in Mique’s kitchen, dining room and family room. These shutters dramatically brightened the room and gave her control over how much light came in the room. After putting in the wood shutters, there is so much light and brightness in the space. If it’s hot I can shut them down or if I want to open it all up, it’s so easy to do. These shutters are custom made to slide side to side, allowing Mique to clean behind them without hitting the kitchen faucet. The bright white color she chose not only bring more light into the kitchen, but bounces light through the entire home. Can you tell that I am loving all of the brightness these plantation shutters bring into our home? It makes such a drastic difference. The shutters themselves are also easy to clean. For more information about how to properly clean shutters and more cleaning tips, be sure to check out Mique’s post, How to Clean Shutters + Fall Cleaning List. Mique chose Blinds.com Premium Wood Shutters in Off White. Great blog. Yep shutters are best window coverings. They are credited for their classic and elegant look as well as their durability. Shutters are easy to use and clean due to the simplicity of their design. In summer shutter helps to add cooling. can control sunlight. My sister has noticed that certain items in her house have started to fade due to the sunlight coming in through the windows. She is looking to get shutters to filter light and add to the property value of her home. My sister will be happy to learn that shutters are easy to clean. I like what you said about how the bright white color can bounce light through the entire home. I think these shutters are a great idea for my sister’s needs. Hi Jade! Shutters are a great option and definitely a favorite of mine! If you need further assistance, please let us know. We have a talented group of designers available to assist you over the phone with narrowing down your options and answering any questions you may have. They’re a completely free resource!